I'm giving Flick a break this long weekend, so he can actually rest before he has to go through Finals. *The Astros were off last night. 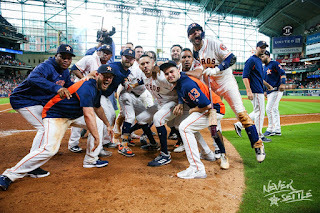 If you count Opening Day, the Astros are 4-0 following an off-day in 2019. *The Astros were off April 11, 15, and 18. Then they play 26 games in 27 days. A.J. Hinch talks about carrying an extra position player during this random stretch of off-days. *Jake Kaplan says McHugh/Miley/Peacock are the steadiness the rotation needs after an off-season of turnover. *The Astros will have the 3rd-lowest draft pool in the 2019 Amateur Draft, at $5,355,100. *After 14 road games to start 2019, it was finally the home opener in Fayetteville at Segra Stadium. They lost, 7-5. Seth Beer hit his 2nd home run of the season, as did 2017 39th Round pick Colton Shaver. *Before you go judging pitching performances at Round Rock, note that all of Triple-A is experimenting with a new baseball in which early returns are projecting a 1,200 Home Run increase from 2018 to 2019. Jake Kaplan looks at how the Astros are planning to manage Forrest Whitley's workload. *Yordan Alvarez is hitting .318/.455/.841. Kyle Tucker is hitting .109/.180/.217. Jonathan Mayo answers a question about Alvarez replacing Tucker on the prospect list. Alvarez is 21, Tucker is 22. We're lucky to have them both. *Mike Rosenbaum and Jim Callis mention the possibility that J.B. Bukauskas is the Astros' closer of the future. Coincidentally, last night Bukauskas started for Corpus, throwing 2.1IP, 3H/6ER, 1K:5BB. Bukauskas, 2019: Three starts, 8IP, 16H/17ER, 7K:12BB. 19.13 ERA / 3.50 WHIP. He has thrown 211 pitches, 113 for strikes (53.6%). *Noted Boras Shill Jon Heyman reports that Dallas Keuchel would be interested in a 1-year deal to reset his value, and mentions the Brewers, Phillies, Padres, and Astros as a potential destination. *SI: The 6-13 Red Sox, currently behind the Orioles, are desperate for answers. *One more link to The Athletic: David Aldridge talked to Michael Jordan about watching Tiger. *ESPN: The fake jobs MLB players reference in order to not tell Randos they're MLB players. *WSJ: The All-Star pitcher who bought a food truck and plans on using recipes from his favorite hometown restaurant. *FanGraphs' Rachael McDaniel: The 17-Year Old Boy in the 16-Foot Boat. *The Ringer's Claire McNeal: Big Bets and Fast Buzzers: The Secret of James Holzauer's "Jeopardy" Success. *Hashtag United - a team created by a YouTuber - just won their league and are eight short leagues away from the Premier League. The Winning Streak has come to an end. Long live the Winning Streak. Houston could only muster four hits though, to be fair, that's the same number as the A's. The difference was a Matt Chapman 6th inning home run. Houston is 12-6. 11.1% of the regular season is complete. They've beaten us four times in a row and we have to have somebody go out there and put up some zeroes. That's exactly what [Frankie Montas] did. In a game like that you have to count on your starter to lead the way and he definitely did that. Any time you win 10 in a row, it's something special. It's a lot of fun, because you come in here every day and you know you're going to win. You just have all the confidence in the world. We knew it was going to end at some point. *For the first time this season, Houston did not record an extra-base hit. It happened 14 times in 2018. *Houston went 1x7 w/RISP. They're hitting .209 as a team with runners in scoring position (31x148). *Wade Miley: 6IP, 4H/2ER, 1K:1BB. He threw a first-pitch strike to 17 of the 23 batters he faced. He lamented a "lazy cutter" to Chapman that decided the game. *A.J. Reed was placed on the IL with an oblique strain. FanGraphs (100-62): 95.9% to win the division, 98.5% to make the playoffs, 21.9% to win the World Series. FiveThirtyEight (101-61): 82% to win the division, 93% to make the playoffs, 20% to win the World Series. Baseball Prospectus (97-65): 92.4% to win the division, 97.7% to make the playoffs, 17.6% to win the World Series. *Levi Weaver has a great piece in The Athletic about batting around and striking out the side. *Joe West ejected Tim Anderson after Anderson got hit by a pitch. *Outside Magazine: Selfie Deaths are an Epidemic. The Astros were off last night and start a three-game series in Oakland tonight. They're still 11-5. *Since the beginning of 2015, the Astros are 23-15 at Oakland. They're 27-14 against Oakland in general since the beginning of 2017. -The Astros are 4-0 in one-run games. -Six of the nine wins have been decided by 1-2 runs. -Astros pitchers have walked 4+ batters in five of these wins, including an 8BB game on April 7 (the Altuve Walk-Off Walk game). The last time the Astros won a game in which they walked 8+ batters was on June 9, 2018 against the Rangers. They're 4-6 when they walk 8+ batters since the beginning of 2015. I thought that number would be more drastic than it is. How the hell do you win four out of ten when you issue eight walks? This team is witchcraft. -The last time that Ryan Pressly allowed a run in the regular season: August 10, 2018. That's a 27-record 27 regular season appearances without allowing a run. That's 25.2IP, 11H/0ER, 35K:3BB. *Richard Justice notes that Altuve and Correa are healthy and happy. *Buster Olney and Tim Kurkjian talked about the Astros' winning streak on yesterday's Baseball Tonight podcast. *Aledmys Diaz and Yuli Gurriel talked to Chandler Rome about the Cuba/MLB deal that was recently scuttled by the White House. *Five years ago the Dodgers acquired Former Astros Great Enrique Hernandez. Here's The Athletic's Pedro Moura on how Hernandez went from $327 paychecks to sleeping in closets to the Dodgers' starting 2B. *Jonah Keri has the Astros at #2 in his excellent Power Rankings rundown, and Collin McHugh is the reason. *On the centennial celebration of Jackie Robinson, MLB is trying to figure out how to appeal to more African-Americans. "The Breakthrough" by William Nack. "Recalling Jackie Robinson Through the Eyes of a Teammate" by Nicholas Dawidoff. "And Then the Barrier Broke" by Jay Jaffe. "Robinson Was Safe" - 1955. You get three points for a win and one point for a draw. If Sheffield United slips up in one of the next two games, that huge matchup between Leeds United and Aston Villa might not matter. I'm going to die. *Fire gutted Notre Dame de Paris yesterday, but some of it was saved. *BBC: The Footballer, the Saudi Prince, and the Proposition.